Air is a mixture of gases composed of approximately 21% oxygen, 78% nitrogen, 1% argon, and traces of other gases. The air we breathe also includes particulate material and gases generated by nature, by man, and by industrial processes as seen in the Figure. We are concerned with the particulate matter and gases which influence our health or comfort, which damage the spaces we occupy, or which effect the products or components we are manufacturing. Regardless of its source, an airborne contaminant can be either an aerosol or a gas. An aerosol is a suspension of solid or liquid particles in the air. Figure helps us visualize the size of aerosols by relating their dimension to the size of a human hair and other objects. 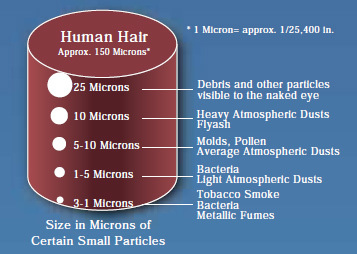 Aerosols cover a wide range of sizes as shown in the attached relative particle size chart. The concentration of different size particles in the atmosphere is usually measured by weight or count. A third method, based on the area projection (shadow) of a particle, can be used for relative measurements of the staining portion of atmospheric dust. Methods for testing filters are based on these three techniques.